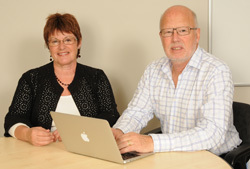 KSJ Associates was formed in 1998 by principal consultants Sue and Kevin Jones. We specialise in Human Resource consulting, working with organisations and individuals that look for pragmatism, professionalism and tailored approaches to fit their requirements. We don’t pull solutions off the shelf. Our approach is to sit down, and listen to your issues. Our banner represents our philosophy. Taken from a painting by renowned Wellington based artist Bob Kerr, it reminded us of the connectedness between HR practices and organisational performance. At KSJ Associates, our strength is our ability to see these connections, make the links and work with you to identify and implement enduring HR solutions.